Why did we go through all this trouble to create Propared? We tried other “solutions”, but they never quite did the trick. Spreadsheets are designed to crunch numbers, not to create complex schedules or enable communication. They are flexible, but ultimately don’t do much work FOR you. 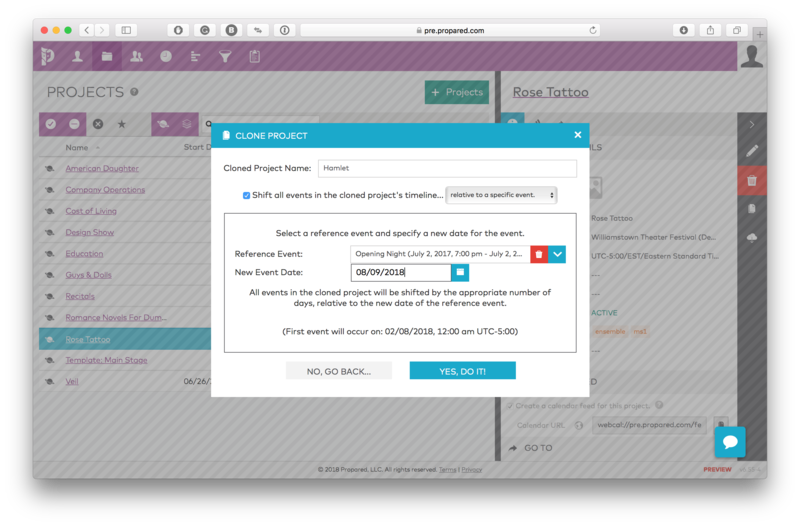 Propared is a database designed specifically for complex schedules. Propared understands People, Locations, and Organizations and what to do with them. Built-in communication tools, make it easy to keep everyone up to speed. 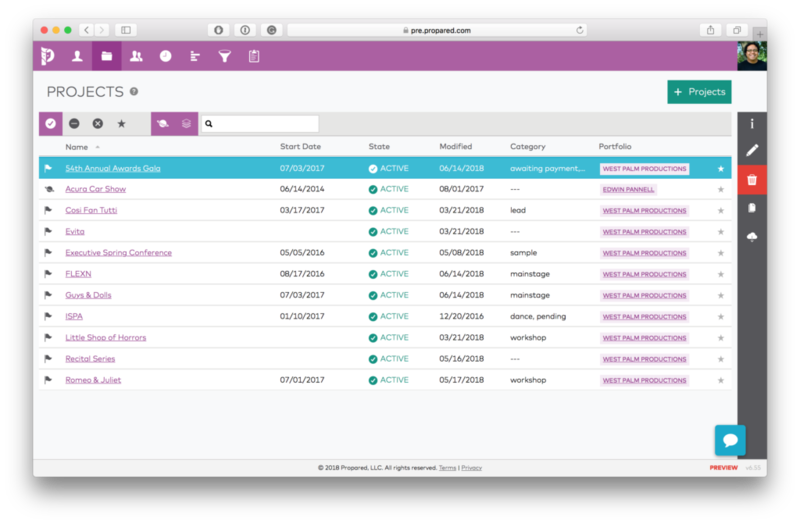 With all your projects together, you can leverage the same information again and again saving countless hours of data entry. A complex season calendar in Propared. Add contacts to your projects from a company-wide shared list. Set up your locations. Define roles before you know who's going to fill them. Distribute schedules and calendars via auto-updating web pages and calendar feeds. 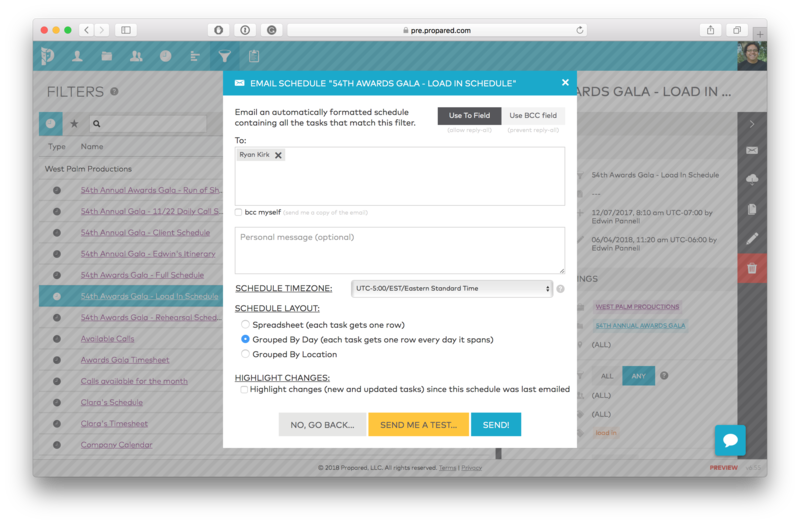 Email updated schedules with changes auto-highlighted. Set up templates and clone past shows to create your entire season calendar in a hours instead of weeks. 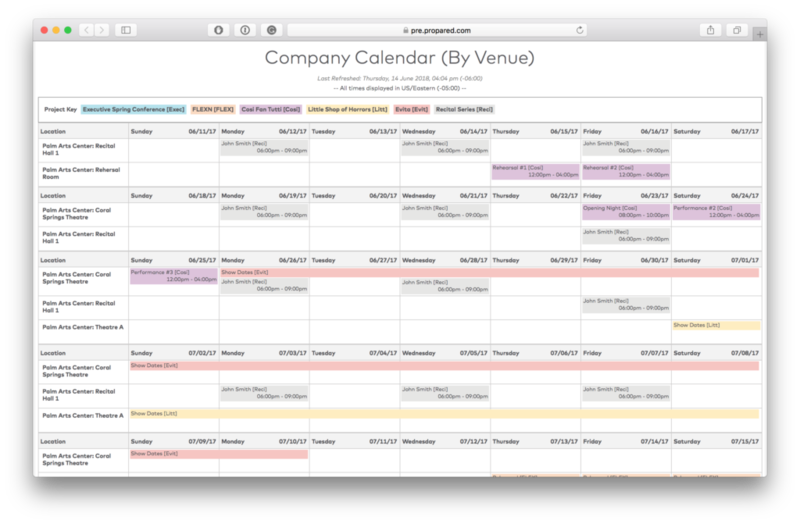 Calendar apps are built to manage the schedule of a single person, not that of large arts organizations. You’re forced to pick one way of setting them up (by venue? by show? by department?). Calendars each have to be updated independently, increasing the risk of mistakes. 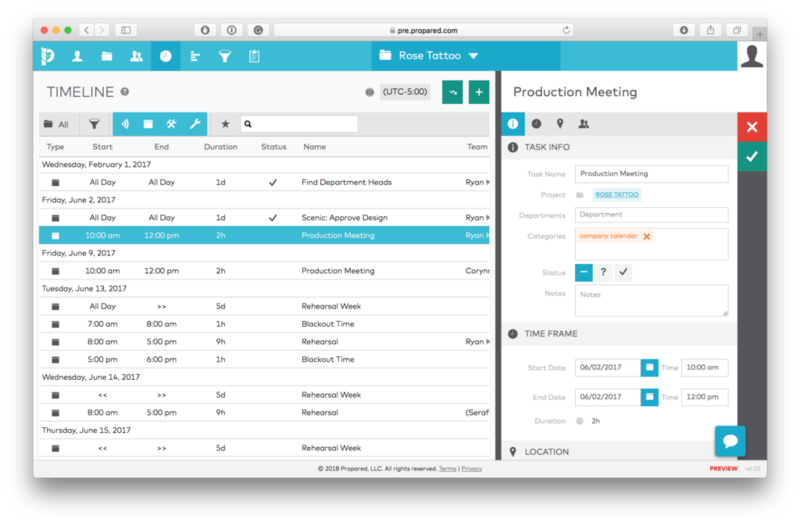 In Propared, you can build limitless combinations of calendars and schedules based on information from your show Timelines. Color code calendars by project and sub-divide each day by location or show. 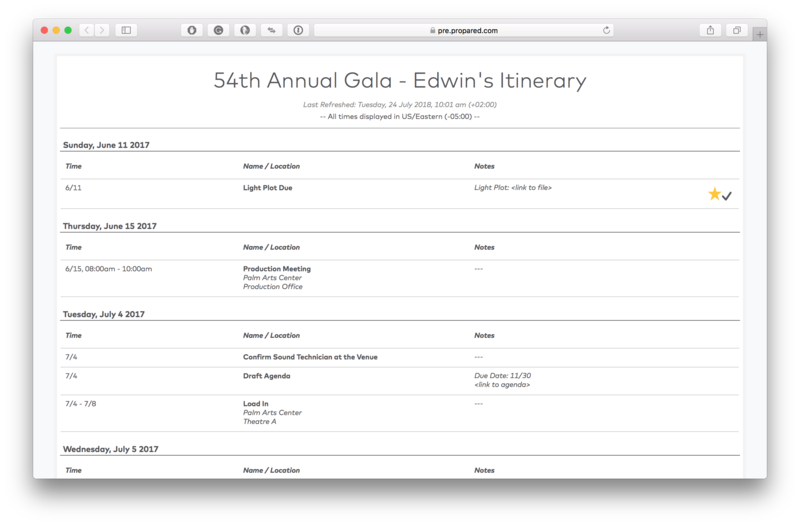 One quick change in the Timeline updates every calendar and schedule that the information appears on! 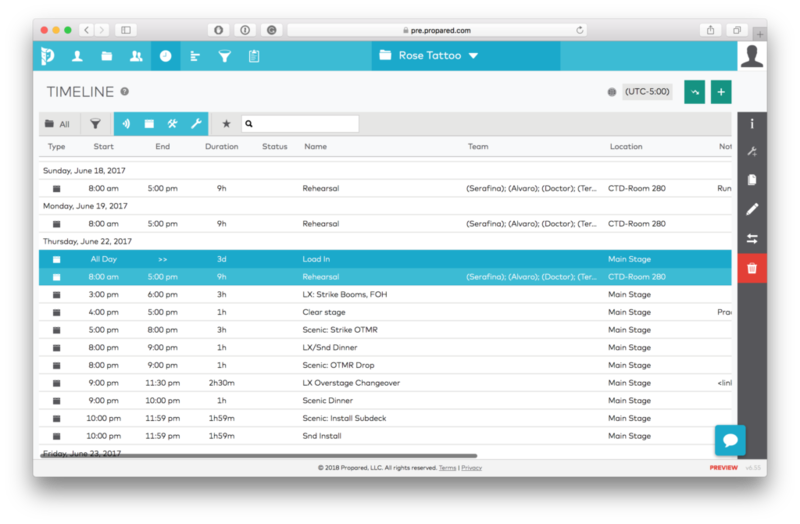 The Filter Screen: set up auto-updating schedules and calendars for both internal and external team members. An example of a Season Calendar created in literally 2 clicks. The Show Timeline - Make a change here and it updates every calendar and schedule that the Task appears on. In the world of Arts and Events, TIME is a far more important resource than in many other industries: Buildings are constructed over weeks and months while shows are planned down to the hour and minute. As a result, project management tools handle tasks well, but they come up short on the scheduling front. 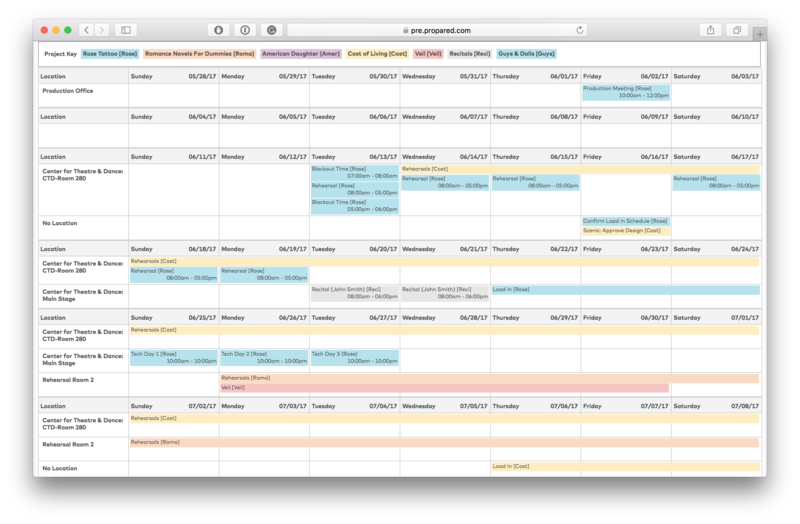 Propared brings Time to the forefront with a Master Timeline so that your deadlines and schedules can live side-by-side. 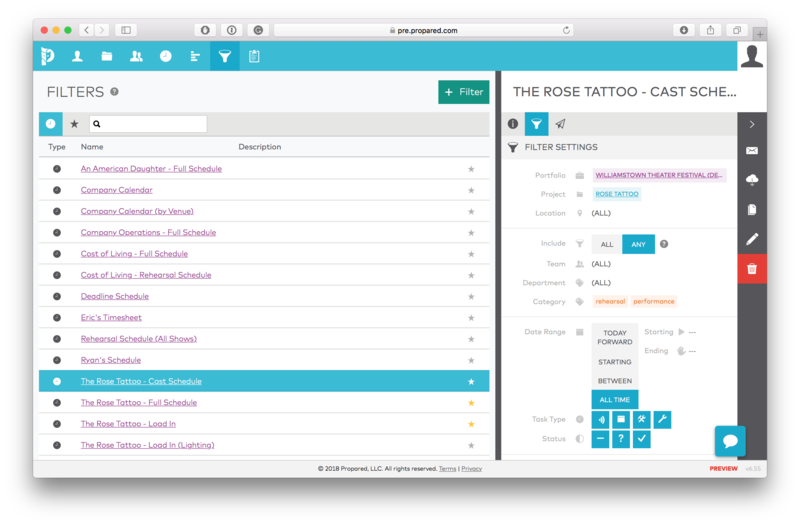 Now you can quickly pull everything related to a person or department into a single schedule. 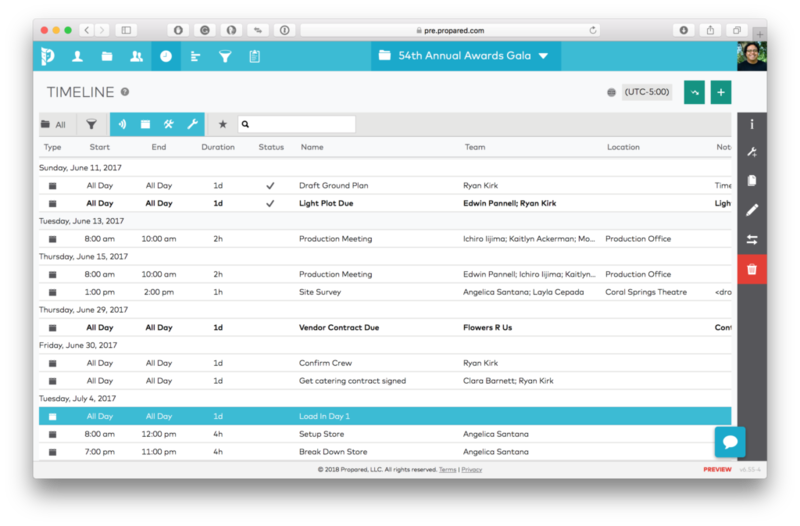 A show Timeline with To-Dos, Rehearsals, and Meetings all in one place. In Room Booking Systems, each show can only be assigned to one location. But productions take place in many locations: rehearsal spaces, breakout rooms, festival stages, and meeting rooms. Plus, you never know when you need to squeeze that site visit into a theatre where the load-in is happening. In Propared locations are assigned to individual tasks, not whole shows. Just like in real life! 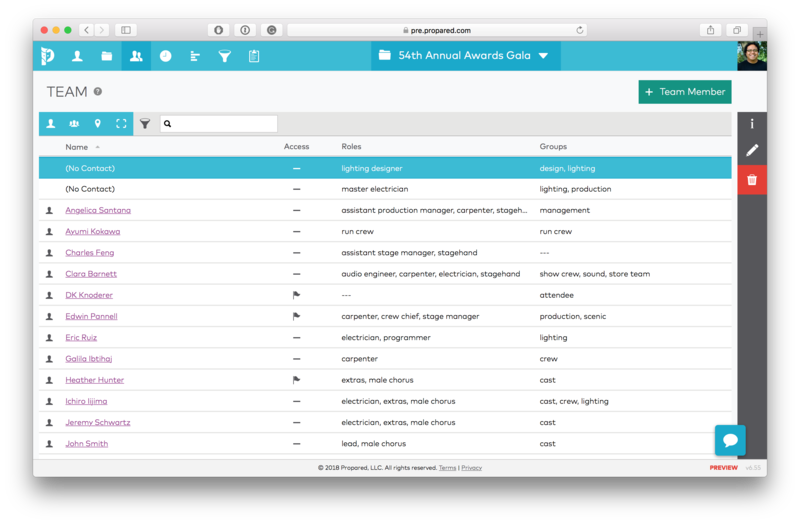 In addition to locations, you can also track due dates, deliveries, crew calls, and run of show, all in the same place! In your Timeline, every task and schedule item can be assigned to a location.